Specimens in museum collections are usually preserved in a 70 per cent aqueous solution of ethyl alcohol or in a 2-4 per cent solution of formaldehyde (5-10 per cent formalin). The great disadvantages of ethyl alcohol are that it is flammable, it volatilizes very readily, it tends to produce precipitates from sea-water, and it causes shrinkage of many specimens. Although formalin is not flammable, and it evaporates less rapidly than ethyl alcohol, precautions to prevent desiccation are still necessary; and it has the further disadvantage that it tends to oxidize to formic acid, which may dissolve calcareous structures, and it has a very strong smell and is toxic. Both ethanol and formalin cannot be used in large volumes in public galleries because of the hazardous nature of the chemicals. So in order to display our colossal squid we will be using a glycol solution with an antimicrobial preservative to prevent microbial growth. We have been experimenting with smaller specimens in jars. Initial results indicate the system will work quite well – although there has been some discoloration, replacing the mix with a second fresh glycol solution does not result in more leaching of the colour, so our plan to replace the glycol before the specimen goes on display should work! Specimens have been preserved for months or years in glycol, but nobody has tried preserving such a large (495 kg) specimen in glycol before, so this is quite a learning curve for us! The glycol will be diluted to between 20-30% with water. To prevent the growth of microorganisms (which could happen as the mixture contains sufficient water to support microbes) we will add a small quantity of Dowanol preservative. This will allow us to have 5,000 litres of liquid in the public galleries, while meeting safety and health requirements. Another concern is that if the soultion becomes acidic the hooks and sucker rings will be dissolved – to prevent this happening we will ‘buffer’ the solution with limestone chips to keep the pH neutral. 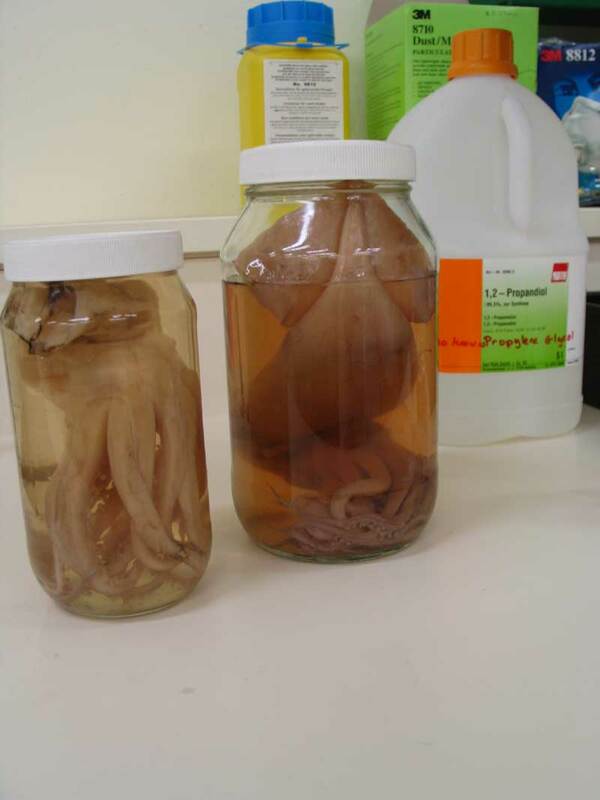 Although glycol has been used successfully for long term storage of specimens on a small scale, the use of large quantities for the colossal squid is in many ways experimental, and one reason why we will be monitoring the specimen constantly while it is on display.